On the Cover: A sliding rock and its trail, Racetrack Playa, CA. Photo by Marli Miller. The Greek philosopher Zeno put forward a paradox that Achilles would never be able to overtake a tortoise in a foot race if the tortoise was given a head start. The Achilles paradox is an example of the summation of an infinite series that always approaches, but never reaches, unity. A similar paradox can occur when teaching students about intermediate forms between any two taxa in an evolutionary lineage. While the mathematical solution to the paradox is simple enough, the concept of the paradox plays a role in comparing gradual and punctuated modes of evolution. The discovery of a single transitional form creates the need for two more transitional forms (for a total of three intermediaries), which then requires the discovery of four more intermediaries (for a total of seven) and so on. Similar to the paradox, it appears that an infinite number of intermediaries must be found to connect any two taxa. The Achilles paradox has other applications in historical geology, such as radiometric decay. Showing how the paradox relates to several aspects of science may encourage better critical thinking on the part of students. Multi-week, research style projects within the context of a one-semester undergraduate course provide scope to explore topics in depth and build student skills. I developed a research-style project for an undergraduate sedimentology course using grain size analysis of sediments that combines developing field and laboratory skills, improving writing ability, exploring statistical techniques and encouraging critical thinking. The project asks students to consider the hypothesis that the grain size distribution of sediment samples can be successfully used as fingerprints to identify sediment transport processes and depositional environments. To do this groups of students work together collecting sediment from beach environments, analyzing the grain size distribution of these samples and use statistical analyses such as histograms and log-probability graphs to help interpret their data. The use of log-probability graphs, which are a somewhat controversial technique in sediment grain size analysis, is chosen to introduce students to contentious issues in scientific research and to encourage critical thinking. Success of the project is dependent on providing students with sufficient time and feedback and to re-write reports, analyze data and contribute to classroom presentations and discussions. Development of such projects requires thoughtful selection of a topic that will meet desired pedagogical objectives and careful structure so that time is managed effectively. At Western Washington University (WWU), we tested the effectiveness of Just-in-Time Teaching (JiTT) methods in introductory geoscience courses. JiTT is an interactive-engagement teaching method developed for introductory physics courses (Novak et al., 1999). The key to the JiTT method is a short time frame feedback loop in which student learning informs instruction. The JiTT method includes several distinct components. (1) Web-based WarmUp exercises check on students' comprehension of reading assignments and ability to connect new concepts to those previously developed. Students submit answers to these exercises via the web up to four hours before each lecture. (2) Interactive lectures based on WarmUp responses emphasize problem-solving skills. (3) Web-based puzzles wrap up topics with critical thinking problems. We conducted our test using two sections of Geology 101 at WWU: the experimental section applied JiTT methods and the control section was taught using the traditional lecture format. Our experimental and control sections were non-major general education courses, had the same learning objectives, and objectives were assessed using the same exams. Students completed a First Day Survey providing baseline data about their demographics, science courses taken previously in high school and college, their attitude about studying science and their knowledge about basic Earth science concepts. On the first exam, the JiTT students scored significantly higher than the students in the traditional lecture section by an average of 2 points out of 50. The JiTT students' combined average on three exams during the course was higher, but not statistically significant. When the data from the First Day Survey were taken into account using multi-variable regression analysis, all differences in performance on exams becomes insignificant. We interpret our results to indicate that scores on objective (emphasizing knowledge and comprehension) exams may depend strongly on students' incoming prior knowledge, more than on the specific methods used to teach the class. Student evaluations of the course taught using JiTT methods were very positive toward the JiTT methods and their experience with introductory geology. Although we hope that such affective differences foreshadow long-term enhancement in learning (that our study did not assess), we caution instructors not to rely only on exam scores or student evaluations to gauge teaching effectiveness. Conversely, we recognize that scores on objective exams may not capture development of higher order thinking that the JiTT method may foster. Students' writing skills develop with their reading skills. Here I provide a five-step approach to reading a paper, and four criteria (the "four C": content, clarity, coherence, and craft) to structure writing and revising of a manuscript. I used these in a sophomore course on plate tectonics. In the first part of the course students read and summarized original papers, while in the second part they synthesized a contentious or recently resolved issue. Both parts stressed the importance of revising drafts. During the course, feedback on drafts and revisions shifted from comments by the instructor to comments by peers. An assessment of the course from student evaluations, colleague feedback, and Writing Center comments, indicates that students' writing did improve. Students acknowledge that careful reading helps them become better writers. The Earth Science Storybook Project is being conducted with Brigham Young University's (BYU) Physical Science 110B (PS 110B) class, which is introductory geology for Elementary Education majors. Under the project, preservice elementary teachers in PS 110B are mentored by university geology faculty and geology graduate students as they author children's storybooks in earth science. The storybooks are then illustrated and made available to practicing teachers for classroom use. This is done by an interdisciplinary collaborative effort between the BYU Geology Department and the BYU Visual Arts Department, which is providing senior illustration students to illustrate the storybooks at a relatively low cost. The goal is to use the mentored writing experience as a means of improving geology content knowledge for preservice elementary teachers and fostering their positive attitudes and self-efficacy toward learning and teaching science. These goals are being assessed by (1) quantitative analysis of the PS 110B class exam scores of storybook authors versus a control group of PS 110B students in the same class who are not storybook authors; (2) a pre- and post-class Attitude Toward Science Survey; and (3) a geology teaching self-efficacy instrument. The results of the project have been positive and indicate that when preservice teachers in a science class are given an opportunity to experience personal mentoring from the teaching faculty they do experience a shift toward a more positive attitude toward science. At a time when geoscience departments are being eliminated or dispersed, three new undergraduate geoscience degree-granting programs were approved during the past decade. These programs have grown into sustainable academic entities that maintain solid enrollments and place students into high quality graduate programs and geoscience careers. The curricula at all three institutions focus on graduate school preparation and/or career placement, and include a strong commitment to fieldwork and undergraduate research. Each program has faculty members who have made program development their primary professional goal. The faculty also faced similar challenges in the early stages of program development, such as having to teach a wide variety of upper division courses, needing to establish program credibility, finding the time and funding necessary for faculty and undergraduate research, obtaining materials for laboratory courses, and recruiting majors. The experience and knowledge gained through the development of these new programs should be valuable for others working to establish new programs and maintain existing programs. Building a field-based laboratory to teach and study the principles of groundwater flow and chemistry has become an ever increasing priority for academic institutions. California State University - Fullerton did it, breaking ground in 2001, and experiences there can serve as a model for others. Two major difficulties to overcome in order to locate and install monitoring wells at Fullerton were the administration's reluctance and the high cost. First, administrators had to be coached to understand both the value of a wellfield and the overall minimal impact of such a system and then multiple, generous donations of drilling contractors, laboratories and suppliers had to be secured. Lastly, a solid curriculum revolving around the wells was prepared in order to make the installation experience worthwhile. Following CSUF's lead, other institutions should not be deterred from developing such a program. This paper outlines the success of such a program and provides insight as to how others might achieve and utilize an on-campus teaching and research groundwater laboratory. The coriolis effect can be a difficult concept for students to understand, particularly in large classes where the effectiveness of physical demonstrations is limited by visibility. We developed a fully interactive computer visualization aimed at introductory undergraduate and precollege students based on the physical demonstration of a marble rolling across a turntable. The marble's velocity, turntable angular velocity and direction, and friction between the marble and the surface can be controlled to allow significant instructional flexibility. Pre and post demonstration student surveys indicate that the application improved student understanding of the coriolis effect, and the use of this type of demonstration was favorably received by the students. This program is written in the free, open-source Python programming language, specifically with the VPython module, which makes three-dimensional, physicallybased, real-time visualizations efficiently programmable for geoscience demonstrations by non-professional programmers. Conceptests are higher-order multiple-choice questions that focus on one key concept of an instructor's major learning goals for a lesson. When coupled with student interaction through peer instruction, conceptests represent a rapid method of formative assessment of student understanding, require minimal changes to the instructional environment and introduce many of the recognized principles of effective teaching that enhance student learning. In this study, instructors from several different institutions developed over 300 conceptests for the geosciences. 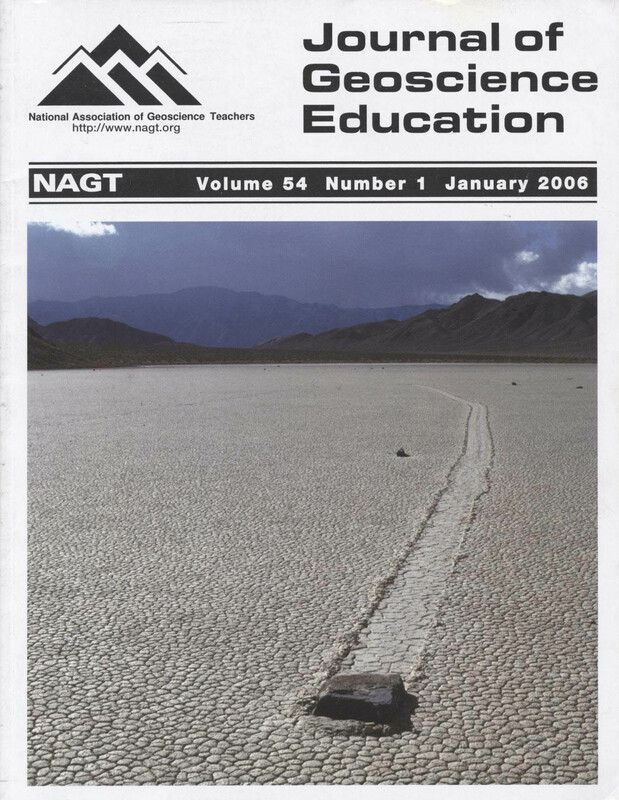 These instructors then used this suite of concept questions in a wide range of classroom settings, including large introductory general education Earth Science courses for non-majors at open enrollment institutions, smaller physical geology classes suitable for majors at private colleges, and in introductory geology laboratory settings. Results of pre- and post-class Geoscience Concept Inventory (GCI) testing and qualitative feedback from students and instructors showed that conceptests increased attendance, improved student satisfaction, and enhanced student achievement. Participating instructors found implementation of conceptests into their classes straightforward and required less than 30 minutes of preparation per class. The conceptest question database is available on-line for geoscience instructors. Eleventh and twelfth grade students in five earth science classes made charts of mineral facts, mnemonic cartoon drawings, and corresponding poetry couplets for minerals on the Mohs scale of hardness. Students' products revealed they enjoyed the activity and learned many mineral concepts. The activity gave the instructor the opportunity to identify and correct several student misunderstandings. Many students displayed creativity in organizing their poems and drawings by a theme, using hardness numbers to represent two things in depictions, using homonyms, and incorporating humor in the cartoons. A rubric for evaluating student work addressed six aspects: correct mineral facts, mechanics of work, poem message, rhythm/rhyme, images, and creativity. Recent educational reports in the UK have suggested that the developments of key transferable skills, such as group working, are a necessary outcome of higher education. However with current logistical problems in higher education, such as increased student numbers, the effective use of group work in field work in particular, is currently a subject of much discussion. A group working exercise based around a one-day soil examination study, as part of a one week residential field week, was developed to evaluate the effectiveness of group work by assigning formalized, rotational, individual group roles. Student responses and instructor observations suggested that there was considerable merit in this approach in terms of development of academic and transferable skills, and in the generation of a positive, experiential learning environment. It is suggested that that this could serve as a precursor to a more formalized identification of group roles that would benefit both instructors and students alike in terms of successful field course delivery and meeting learning outcomes.